In the Adventure game My Time At Portia you can unlock a total of 91 achievements on Steam. In this guide we show you all the achievements and their conditions. Pass the test to enter the Collapsed Wasteland. Complete all five Dee-dee transport commissions. Provide 100 Data Discs to the Research Center. Provide 100 Data Discs to the Church of the Light. Help the Portia Tree Farm be operational again. Help fix Ack the living AI. Help build the Portia Bridge. Pick up 7 gifts during the Day of the Bright Sun event. Keep the spiciness of the hotpot above 85 for 10 seconds during the Winter Solstice festival. Try lasso roping for 50 times. Win at Cross Five 50 times. Gain 150 points in the Dart game. Finish with a 90% or above accuracy rate in the Balloons mini-game. Win the highest possible award in the Slots mini-game. Win 50 games of Rock Paper Scissors in 3-0 fashion. Completed 100 Inspections at the Commerce Guild. Cumulatively picked up 500 feces. Recover 15 different types of relics. Be ranked number one in a seasonal workshop ranking. Workshop reputation reaches Level S.
Complete 150 Commerce Guild commissions. Expand the land area of the workshop to the maximum. Successfully make 30 different dishes. Fail at cooking 1 time. Enter the Abandoned Ruins for the first time. Discover a mysterious room in Abandoned Ruins. Place 5 advertisements in the Portia Times for the workshop. Have maximum HP reach 2000. Have maximum Stamina reach 600. Defeated all the people that can spar in Portia. Clear all the levels in any Hazardous Ruins. Talk with other town folks over 500 times. Accumulatively give out 500 gifts. Give out a gift that the other person doesn't like. Accumulatively give out 50 gifts that people like. The first photo taken with someone else. Accumulated 10 meals during dates and play dates. Accumulated 10 times in the Swing mini-game where the play date is happy with the result. Accumulated 10 times during the Doodles mini-game where the play date is happy with the result. Did I just use the Blender to mix feces...? 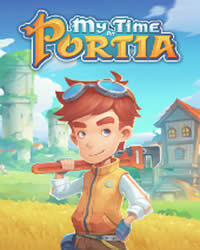 Complete the new Portia Harbor. Pass the trials set by Ginger's family. Built a clinic for Phyllis. Accept the proposal from Mint. Get more than 40 Ghost Badges in Haunted Cave Exploration. Find more than 10 Ghost Badges in a single Day of Memories event. Place first in five fishing competitions. Use 50 Fireworks in one setting. Getting caught by the Sky Shark Pirates. Defeat the rogue knight and All Source. Propose to Emily in front of the Pumpkin Princess House. Enjoy some fireworks with Dr. Xu. Complete the adventure in the cave with Arlo. Achieve the best relationship with your spouse. Have or adopt a second child. Achieve the relationship "Happy Child" with your kid. Get to Level 50 of the Deepest Ruins without using Vending Machines. Clear Level 10 of the Deepest Ruins. Clear Level 50 of the Deepest Ruins. Clear Level 100 of the Deepest Ruins. Used all items from the Vending Machine in the Deepest Ruins.